My final bold call for this summer is to eventually see the drought conditions across KS/MO/IA to radically improve by the end of met Summer. As we begin to "shift" away from the pattern we have seen for the most part of summer, I'm convinced that the overall pattern turns wetter the farther south you go. This is due in part by the driving force of the -EPO and somewhat of a blocking signal that is appearing in some of the modeling. IMO, August will be an interesting month and will give some of us an early taste of Autumn, at times, the farther north you are. Would have to do some research to find out the last time Nebraska was this drought free. CFSv2 trends for August...carve that trough out...sign me up! Looks good to me and what will likely be a cooler end to summer. FWIW, I'm hearing the latest Euro weeklies are drastically cooler. A cooler than normal aug-sept would be nice for a change! I like the way things are looking for late summer. Ive had enough heat already lol. Seeing lot of and enough model trends to give around a 70% chance that the hottest part of summer is over for many, if not most of us. Looking like one more brief hot spell possible around mid-August but overall, if you don't like "dog days", I think there's good news here. I think we're about to close them out in July instead of August. If even half or slightly less of the cooldown from the GFS is true, I may even close out with a normal summer after the blazing, humid, opening 45 days. 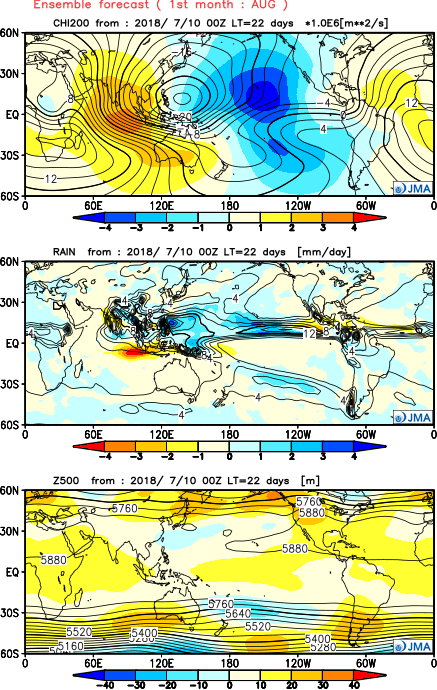 The JMA monthlies came out today and suggesting yet another month where a major trough is setting up shop across NE Canada where it has been rock steady since May. It is also agreeing that the entire North American 500mb amplifies which creates a seasonal look across the eastern CONUS. Fits the pattern and idea of a cooler finish to Summer. If that trough becomes reality i hope it is far enough west for my region! CPC's outlook for August...IMO, to warm around the GL's/MW region...you think the troughs this month are unusual??? Wait till August my friends! As we head into the "heart" of summer, things begin to change and the idea of a cooler mid/late summer is showing some credibility if you are to agree with this model. All things considered, this fits my idea quite well actually. I think we are going to see some unusual amplified patterns in July across North America. This 500mb pattern potentially suggests cut-off systems skirting the GL's region mid summer. Remember when I mentioned we should see the "cold" part of the LRC cycle through in and around the 4th of July holiday??? Something tells me there will be an interesting scenario playing out near the GL's/MW region. We'll see. We definitely are enduring an unusual cut-off trough spinning near the GL's, but we did NOT see the colder side of the LRC in early July. With that being said, however, I've been waiting for one piece of this year's cyclical pattern to show up in the summer which would solidify a vision I had long ago. That would be a lobe or piece of the Polar Vortex. While not that unusual to see it spin down into the lower 48 during the cold season, it is highly unusual in the summer. We saw it in 2014...it made headlines, will the July '18 version make headlines??? Both the GFS/EURO have a lobe of the Polar Vortex just barely skirting the GL's to close out July. I saw similarities that this summer had when comparing it to the summer of '14. We may be seeing a glimpse of it come into fruition late month. I wasn’t paying attn to models back then as much as I do now. Nonetheless, that would be a comparable analog since the following season had a mod Niño. So is this a new wave in the pattern or old? 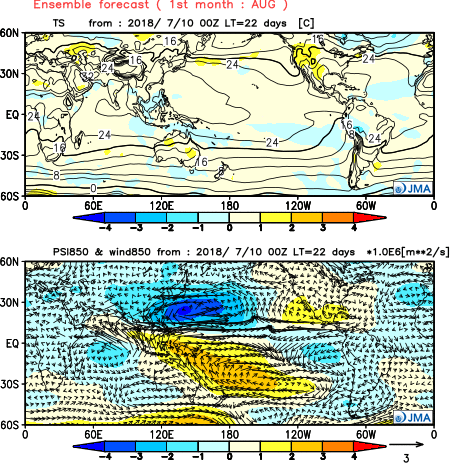 Old wave...IMO, the SST’s in the NE PAC are enhancing the amplification this cycle and prob one more time in Sept. By end of Sept, we already start seeing the new pattern in the far northern latitudes. In hindsight, I see a lot of connections to the old pattern. You're right. Summer cancel? If not cancelled, it's sure taking a shot to the face pretty early this year. Next 10 days per EPS and GFS is absolutely awesome for this heat hater. In your area, at least for a bit, enjoy the reprieve from the heat amigo. I think your still going to see some heat before met Autumn. That ridge down south has been pretty feisty this year. It's going to take a lot for it to really beat down...it will eventually. Yeah. I can hope, but I think you're right. May see it rear it's ugly head the last week to 10 days of August before it gets obliterated for good or stands upright over the west coast. So far, its been a dry, hot summa! We can use some H2O. Up north, yes. Down here I'm likely going to be below average when all is said and done, or at least I think. This is actually turning out to be a fairly nice Summer. Although, I wouldn't mind a few severe storms from time to time. Where are the good ol days where we would get a dark sky outta nowhere and all hell would break loose from loud thunder, vivid lightning, torrential downpours, trees down from damaging winds, flooding all ova the place, and need I go on, you get the picture. Afterwards, the sun would come out and call it a day. That's a wrap. 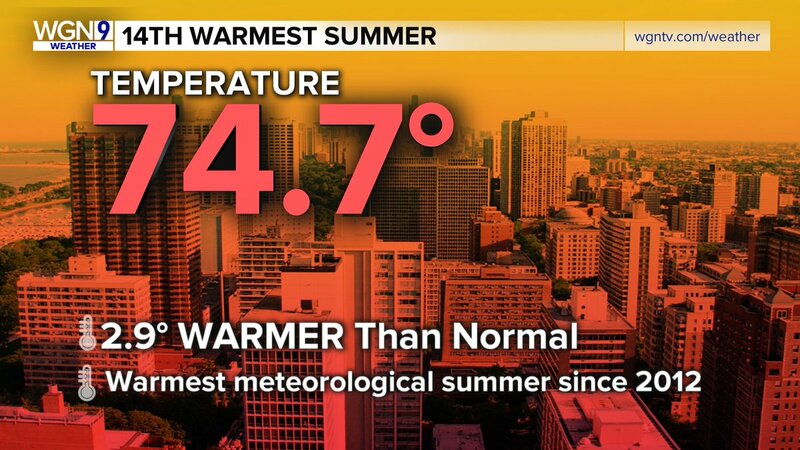 Chicago ended up close to 3F above normal temp wise. This Summer was actually a very decent one. Great looking sunny days w warm to hot days. No gloomy days at all. Just wish we had more t'stm activity from time to time.